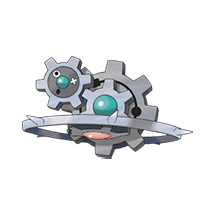 Like a number of other Pokemon, Klinklang only sees the usage of one specific Moveset in the Meta Game of Pokemon. This spread is usually ran with Shift Gear and Gear Grind, two moves that are virtually exclusive to it and only it (outside of genesect for Shift Gear). The two can be a lethal combination, but only if it has the chance to set things up properly. Summary: Like I said, this is truly the only Klinklang Moveset that is constantly used. Shift Gear instantly doubles Klinklang's Speed and further boosts its Attack by 50%. One of these is usually enough to poke holes in other teams, but two of them is definitely the way to go if you have the chance to execute them. Gear Grind hits crazy hard with STAB and Shift Gear, and breaks through Focus Sash Users since it hits the opponent twice. Return is a good change-up that still hits pretty strong. The last move is determined by what you ultimately would like to use: Substitute provents status conditions lie a Burn and allows Klinklang the opportunity to setup, Magnet Rise takes Earthquake out of the situation, and Wild Charge can give even further coverage. Countering: Obviously a Taunt User or a Prankster Will-O-Wisp are the best route to go, as they will stop Klinklang in its tracks. Fire Types, specifically of the Special Attack natures, also fair quiet well against it.